Description of "SHIVA IN CONVERSATION WITH SHAKTI & GURUJI SPEAKS "
Kali Yuga is often described as age of darkness, because kali refers to the last and worst of the four Yugas or ages. Kali has got many interpretations depending upon the context. Some of the commonly understood meanings of Kali are strife, discord, quarrel, contention, etc. There is a reference to this in detail in Śrīmad Bhāgavata (IV.viii.3). In general, it is believed that God realization is difficult in kali yuga, due to the predominance of adharma (unrighteousness, injustice, wickedness) over dharma (virtue, morality). It is also interesting to note that kali also refers to symbolical expression for the numeric 1 (probably referring to numero uno). If we seriously investigate why adharma prevails over dharma in the recent times, we will find huge imbalance in the three guṇa-s - sattvic, rajas and tamas. Sattva guṇa means the quality of purity and knowledge. The presence of other two guṇa-s is not very prominent in sattva guṇa as this guṇa is endowed with the highest purity. Rajo guṇa is the activity of passion. Tamo guṇa is inertia or ignorance. These two guṇa-s have higher trace of other guṇa-s. Guṇa-s are the inherent qualities of Prakṛti. Ego and intellect originate from guṇa-s that are present in all the evolutes of Prakṛti at once, but distributed in unequal proportions in each individual. The predominant guṇa that prevails in an individual is reflected through his thoughts and actions. This book will make an attempt to explain how to transcend these guṇa-s to experience bliss, which is the infantile stage of our spiritual pursuit. This book covers birth, death, transmigration of a soul after death, its requirements after exit, Self-realization, transmigration and finally, Liberation. The entire book will be logical, pragmatic and realistic in its approach and may not be based on certain practices that are being followed today. Shiva and His Consort Shakti descend from Mount Kailāsa to the material world and while going around the material world, Shakti seeks various clarifications from Shiva. Hence this is titled as Shiva in conversation with Shakti. The next section is titled as Guruji Speaks. This is in the form of conversation between a Self-realized Guru and his disciple about various stages of spiritual life, Self-realization, meditation, etc. 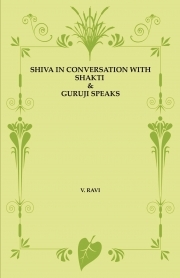 Reviews of "SHIVA IN CONVERSATION WITH SHAKTI & GURUJI SPEAKS "